Hello Operation Write Home friends, it's Jan here today issuing a special challenge in celebration of our birthday! The challenge is "I'm So Grateful", make a thank you, grateful for you, Any Hero gratitude, etc. kind of card to send in your next OWH box using any supplies (but glitter) you'd like and enter your card here in our InLinkz widget. We have a fabulous prize sponsor for this challenge too! One lucky winner will receive a one year subscription to Through The Craftroom Door on line magazine! I can't wait to see all your fabulous cards! Jan, that is one gorgeous butterfly! Love your card. Oooh, that butterfly is awesome! Love the colors! 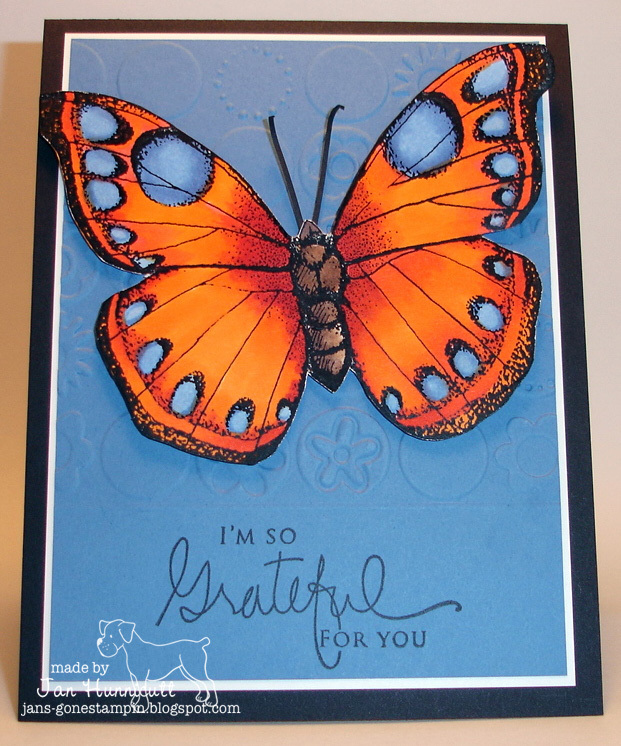 Jan - I love the colors on that butterfly and the embossed background is jut the right touch! Beautiful card! I love the orange and blue combo and the embossing on only part of the card looks great. This was a wonderful challenge! I will try to make a lot more of these. Thank you for the challenge! Jan, I really like the way you only embossed a part of your card. It defines the area with the butterfly!